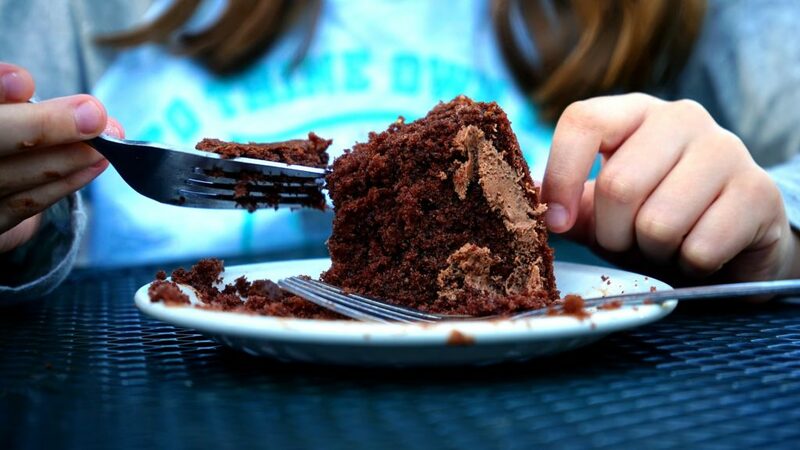 National Chocolate Cake Day today!! Rudolf Lindt, the famed chocolatier, created a process called “conching” in 1879. This process produced a smoother, silkier chocolate that could be used for baking. This enabled bakers to transform white or yellow cakes to the yummy chocolate cakes that we know and love today. There are SO many different types of chocolate cakes. We love the classic chocolate cake with chocolate icing. Also popular is German Chocolate Cake and Chocolate Mousse cake. Yum! Cocoa beans, the base for making chocolate, are seeds from the cacao tree. The beans are found inside the cacao pods; each pod contains 20 – 60 cocoa beans. Our Signature Cake Recipe with Chocolate Buttercream are sure to be a big hit for those with a sweet tooth!! So rich and delicious. Stir together sugar, flour, cocoa, baking powder & soda, and salt. Add eggs, milk, oil and vanilla. Beat on medium for one minute. Cover bottom of pan with parchment (cut into circle) and sides with parchment, cut rectangular strip.If you don’t want to cover pan with parchment, spray with cooking spray and powder with flour. Cook sugar and egg whites over a double boiler until 60F. Beat the sugar and egg whites into hard peaks with whisk, and let it cool. Once cooled, add salt, chunks of soft butter, melted chocolate and vanilla, and mix with paddle attachment until smooth.